CADAC’s UK distributor has supplied a CADAC CDC8-16 to Glynd?r University AVL Technical Services for evaluation and first time ever use on a public performance. The company’s latest digital console proved itself invaluable and capable of the highest performance standards, when deployed by senior AVL technician Darren Hughes, on his sound design for Chester Operatic Society’s production of Kiss Me Kate at the university’s William Aston Hall in Wrexham, Wales. "We have two in-house desks available to productions in the 900 seat theatre," explains Hughes. "But when we get a more demanding production in we often decide to bring in something special – more cutting edge – to deliver the best production capabilities. I had seen the CDC8 on the CUK stand at last year’s PLASA Focus and had been very impressed with the look of it. When the booking for Chester Operatic Society came in my thoughts went straight to the CADAC and I contacted Stuart Cunningham at CUK to see if it was at all possible that one might be ready and available for use on a live production." With CADAC commencing production of the CDC8 ahead of its imminent commercial launch, CUK was able to supply a CDC8-16; an ultra-compact frame-size variant of the console with identical 128-channel I/O count, functionality and processing architecture as the full 32-channel version. The compact form factor and performance capabilities of the small frame variant ideally matched AVL Technical Services’ production requirements, offering the I/O capability and large format touch screen operating interface of the 32 channel variant but requiring far less than the usual seat kill at the FOH mix position. "From the first day load-in for the production I realised how good this desk was," continues Hughes. "Within half an hour I knew where everything was and operation was highly intuitive centred around the 24-inch touch screen. There is no need to look at pages within pages, the CDC8 has everything logically arranged on the one screen, and with the tight time frame from load-in to first performance, this was critical." As well as offering significant improvements in operation, the scale of the production demanded a greater microphone channel count and length of run; and then there was the question of sound quality. "We had 12 wireless microphones – AKG DMS 700 V2 digital transmitters / receivers with HC 577 L headworn mics – two shotgun mics, three boundary mics, an array of seven orchestra pit mics, and DI lines for bass and keys; together with effects returns, SFX, house music, talk-back, we ran around 38 channels. With the number of microphones in use, getting a very clean signal was paramount. The house digital console is good for its age and price-point but the sound is very clinical, cold and noisy. CADAC’s pedigree in musical theatre, with consoles like the J-Type, is well reflected in the sound quality of the CDC8. The desk is very strong is this area. Just push up the fader and the sound is there, very clean and nice to work with." As senior audio visual and lighting technician at Glynd?r University, Darren Hughes is the senior member of a team that looks after the AV and lighting requirements for more than 100 class rooms, 10 lecture theatres, a video conferencing suite, an international sports stadium, various student bars, and three performance venues, including the 900 seat William Aston Hall, across five campuses throughout the UK. Following an extensive freelance career from the age of 16 as both a studio and live sound engineer, he attended the three-year BSc (Hons) Studio Recording & Performance Technology undergraduate course at Glynd?r University, becoming house engineer for a number of venues around the Wrexham and Chester before taking up his current position in 2011. The CDC8 was deployed with the house JBL VRX system, comprising four flown VRX cabinets and two twin 18 inch SRX subs, controlled via a DBX DriveRack 482 and powered by Crown I-T4000 amplifiers. The Chester Operatic Society’s production of Kiss Me Kate ran from 12 to 18 May. 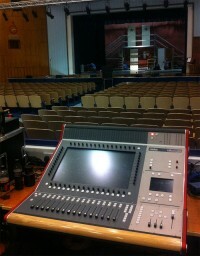 In picture: CADAC CDC8 on Kiss Me Kate at Glynd?r University William Aston Hall.